Blue rules the roost when it comes to projecting a cool vibe, making it an ideal choice for the bedroom. It is one of the most restful and pleasing colors of the spectrum. 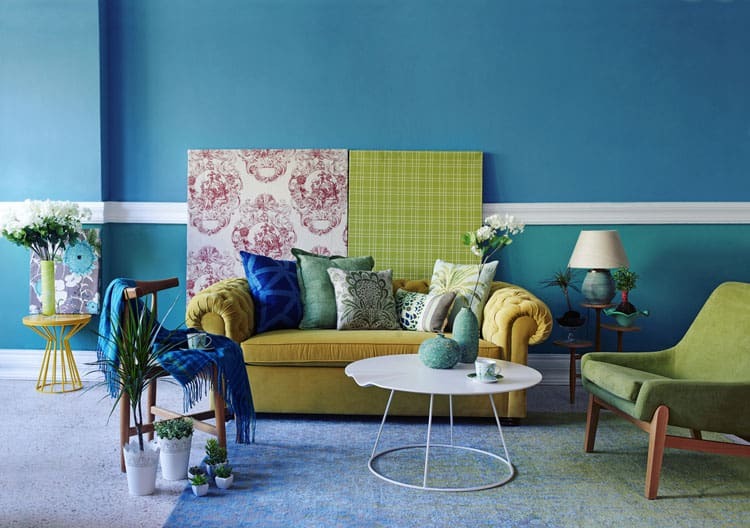 This cool hue comes in a range of shades from pale baby blue to inky cobalt, so it’s almost a given that there’s a blue out there to suit your design personality. Before you choose your blue, consider your decorating style. If you’re a traditionalist, saturated shades like steel or teal create the perfect canvas for timeless furnishings. Conversely, vivid hues such as aqua or royal blue work particularly well in modern applications. 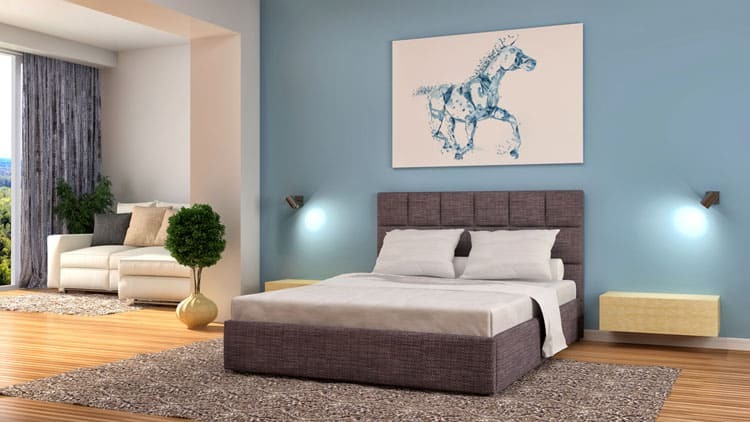 Use the relaxing and cheerful qualities of blue to transform your ordinary bedroom into something special. Check out these images of our favorite blue bedrooms to inspire your dream! Bring on the blue—walls, curtains, bedding, rugs and more! In this formal bedroom, custom linen drapery panels cover the windows of this historic home. Blue and white pinstripe seersucker bedding adds a bit of whimsy to an otherwise serious New England Greek revival. 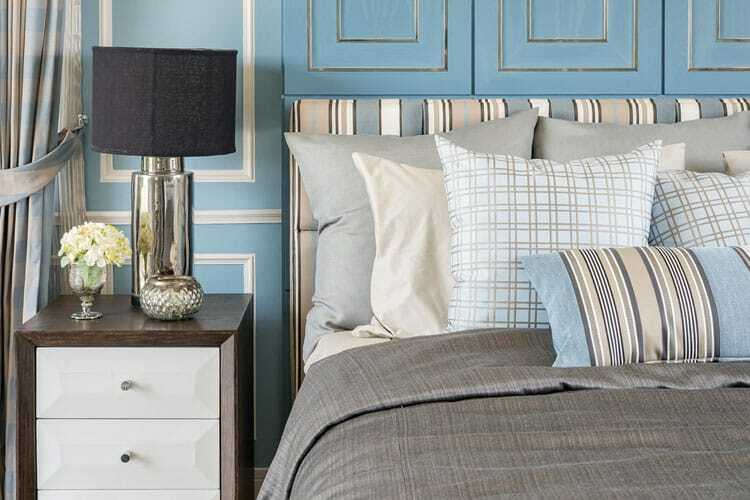 Add interest to your bedroom with an unexpected accent color to complement your chosen shade of blue. The leafy green bed pillows give this striking blue room a fun and unique personality. The pop of green also helps break up the expanse of vivid aquamarine. By matching your bedding to your blue wall color you’ve created instant wow factor. 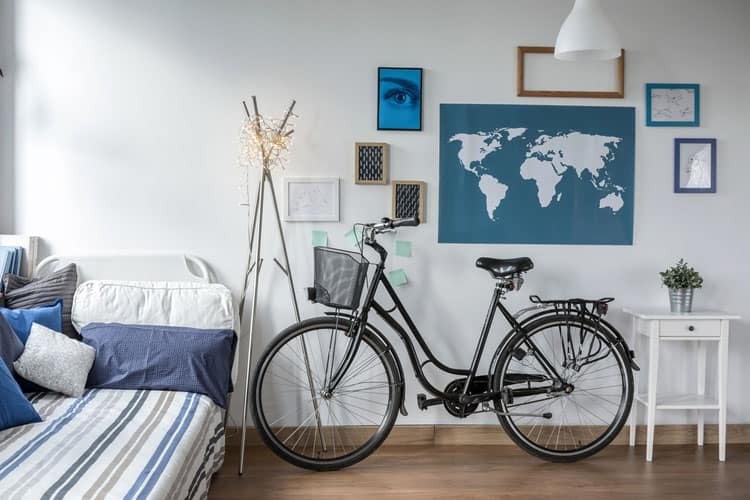 This is one of best ways to keep a bedroom looking consistent if you’re not terribly confident in your decorating skills. Here, the color of the bedding, upholstered bed frame and walls pull everything else together, giving it a sophisticated feel. 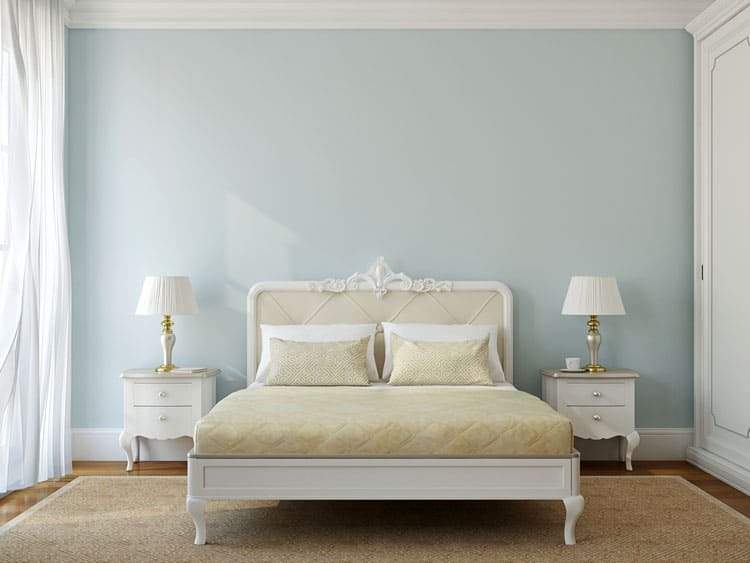 If you’re hesitant about using blue color on your bedroom walls, try a very light shade such as this super pale blue. Add balance with a bolder blue in bedding, accessories and artwork. In formal and traditional bedrooms, saturated shades of blue create a stately backdrop for treasured antiques, fine fabrics and classic furnishings. 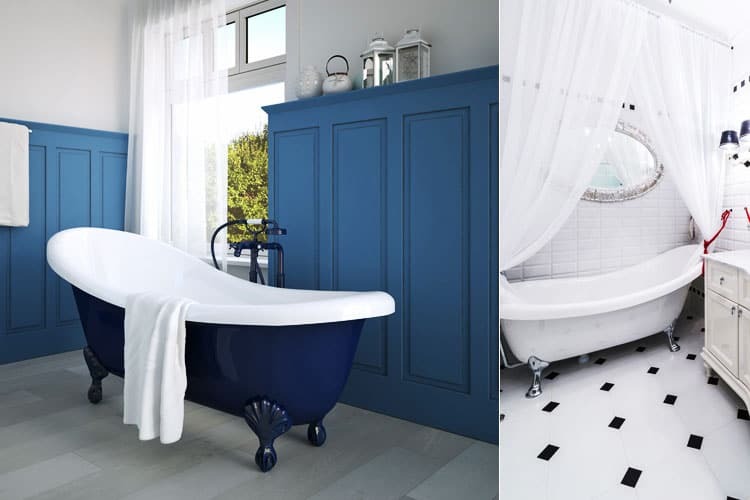 But don’t think you have to settle for royal blue—there are lots of alternatives that create a similarly regal mood. Add style to your blue bedroom by using a mix of patterns. Here, the mod floral on the duvet creates visual interest and pairs nicely with the coordinating small prints. Used in moderation, these patterns go a long way to enhance the blue color palette. 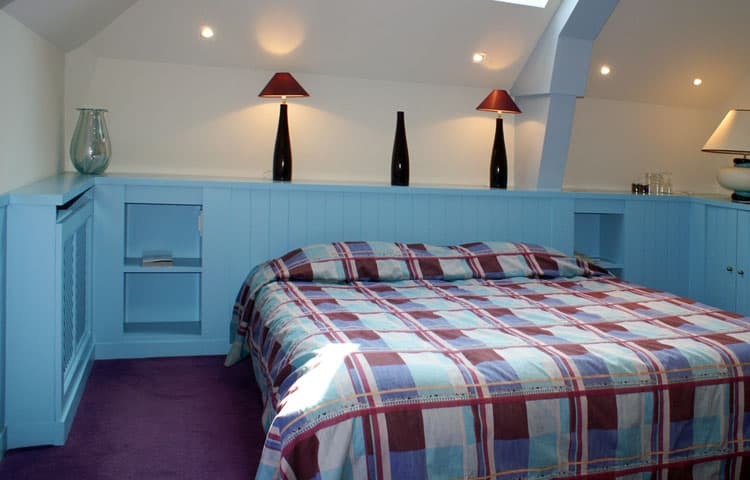 This muted celestial blue is repeated in different fabrics and finishes throughout the bedroom. Using the same color adds interest and allows the eye to move freely around the space. While the wall detail and fabric patterns create subtle contrasts in the room, they all manage to create a sense of harmony. 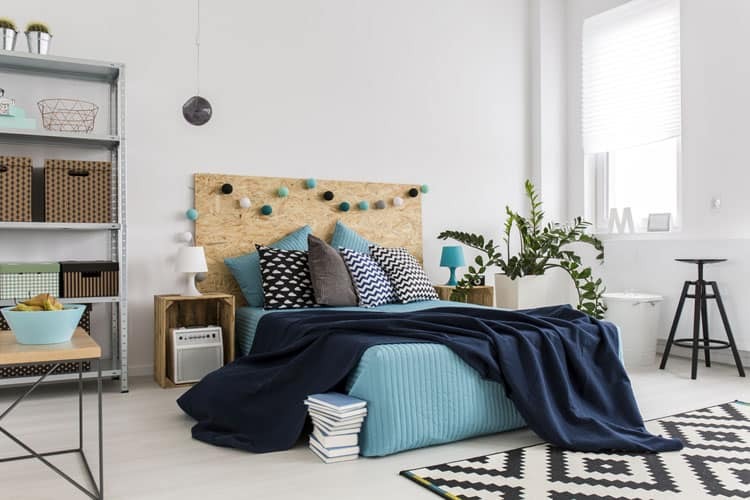 Keep your child’s bedroom light and open by using clear, watery blues. These soft shades keep the space visually quiet, making it a great for homework and creativity. In this room, white walls create a backdrop for simple blue bedding and accessories. If you are on the hunt for a blue for your bedroom, consider teal. This rich color typically contains a touch of green, giving ordinary blue a unique twist. 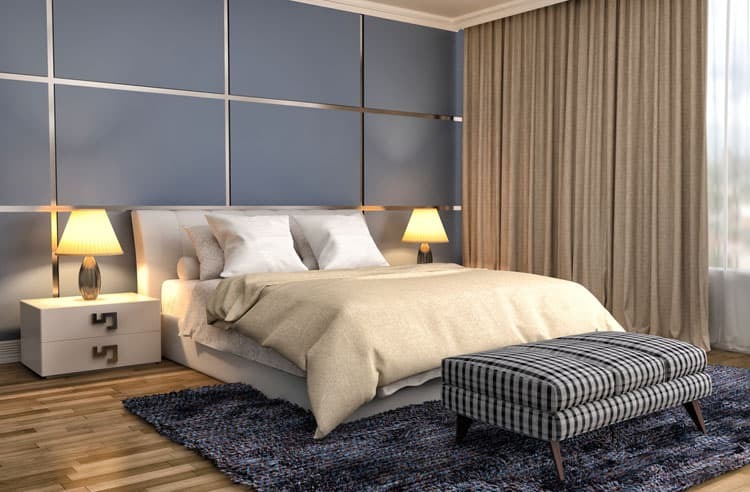 This bedroom features a color scheme of teal, steel grey, white and wood tones that create a peaceful sanctuary. Blue is the ideal color for Type A personalities. If you go strong all day long without a moment’s rest, you need a bedroom that serves as a restful haven. At the end of a crazy day, blue will take you from revved up to unwound in a matter of minutes. It might even reduce your blood pressure and anxiety levels. 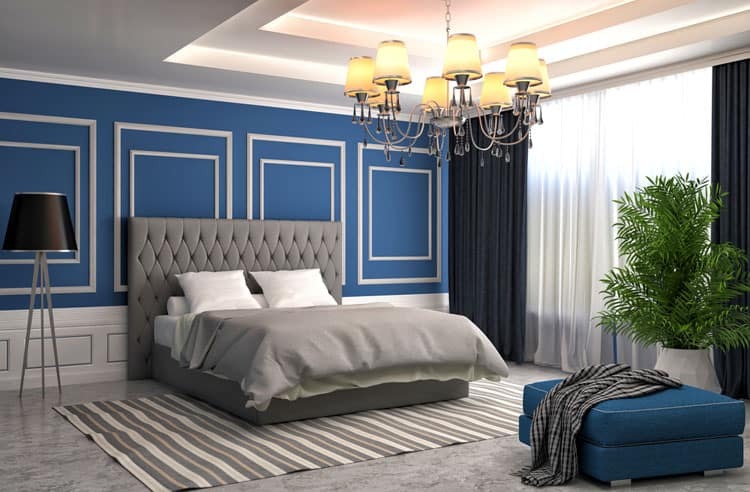 Why do blue and white look so great in a bedroom? Because this classic color combination is a graphic favorite that gives any space a crisp, stylish flair. The indigo pattern duvet and pillows contrast nicely with stripes and solid whites of the bed linens. The look is casual and timeless. 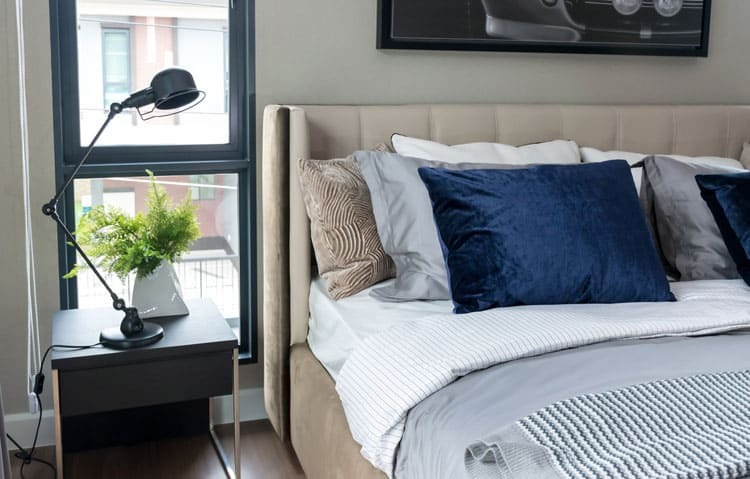 This studio “bedroom” manages to incorporate a chic color palette with an efficient use of space. The daybed/sofa is dressed in blue stripes and a mix of companion fabrics. The pale blue walls look as though were destined to be a backdrop to highlight a collection of the owner/artist’s original works. The easiest way to enliven a neutral palette is to add a jolt of contrasting color. This bedroom began as a sea of whites and greys. The designer wanted to introduce color and create drama with several shades of blue. The fabric-covered wall draws the eye in and the artwork, accent pillows and navy curtain panels seal the deal. This bedroom has a definite colonial flavor. In a room with a four-poster bed, tropical prints, and wicker, a soft sky blue on all four walls works to create a soothing space that could easily be located in the British Virgin Islands. A bachelor pad atop a high-rise in Singapore needed a bedroom with character for its highly successful resident. His designer turned the space around with a masculine navy color palette. The strong color paired with modern furniture pieces, unique light fixtures and original art gave him a space to unwind and enjoy the city views. Create style and sophistication with floor-to-ceiling bedroom curtains. Use a blue that is several shades darker than the wall to create subtle contrast. 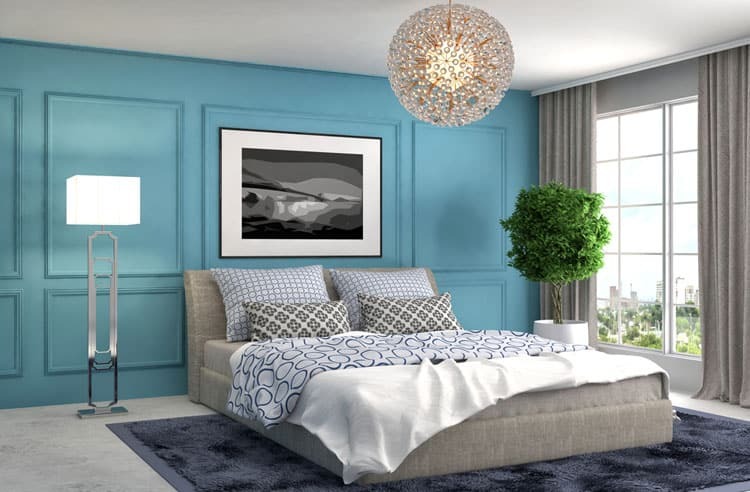 To add dimension and depth to your blue bedroom design, install picture frame molding on the headboard wall as a focal point. Striking pattern is a fabulous way to being a modern aesthetic into your bedroom’s design. The bold, blue-grey damask pattern wallpaper creates the perfect background for the upholstered headboard and white antique furniture. Keeping accessories to a minimum allows the wallpaper to shine. A cottage bedroom dressed in a soft palette of powder blue and white is pure perfection. The chalk painted furniture and wainscoting look beautiful paired with the tonal wall stripe, blue trimmed curtains and floral bedding ensemble. 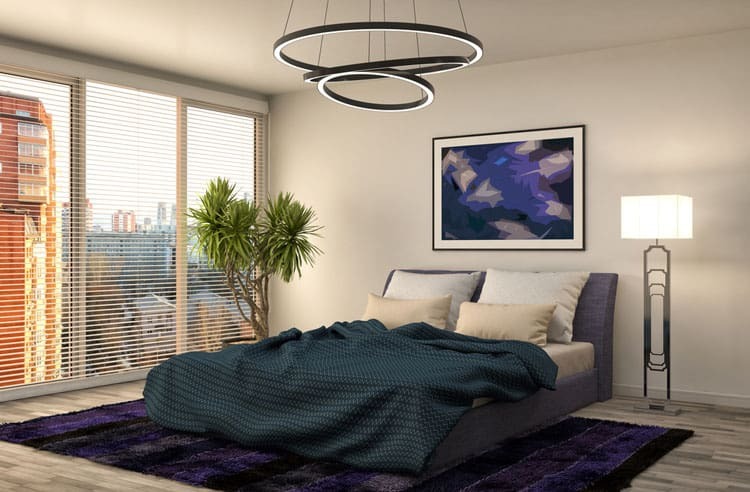 This tailored bedroom is all about color and touch. The designer chose fabrics that make you want to feel the textures. The shimmery blue dupion pillows create a stylish counterpoint when paired with casual cotton bedding and the homey chenille blanket. In addition, the custom headboard in nubby linen and accents of metal and wood make the entire space a tactile delight. 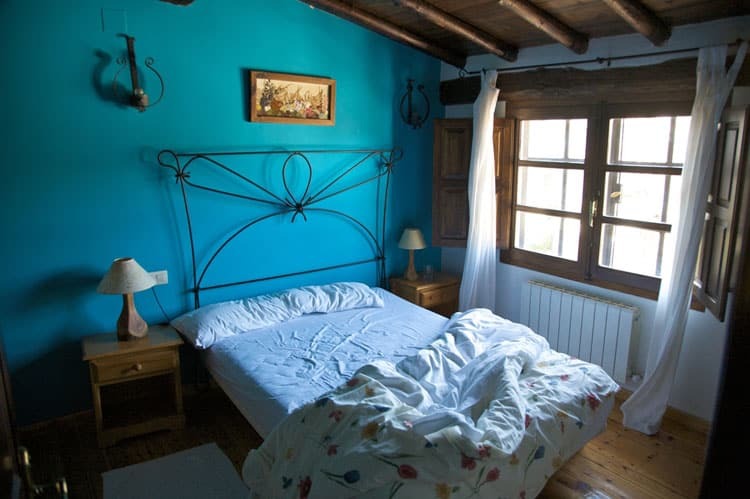 The owner of this humble Italian cabina wanted to recreate the color of the sea in his bedroom. The confident splash of ocean blue dominates the close quarters, giving the room a fresh vibe. 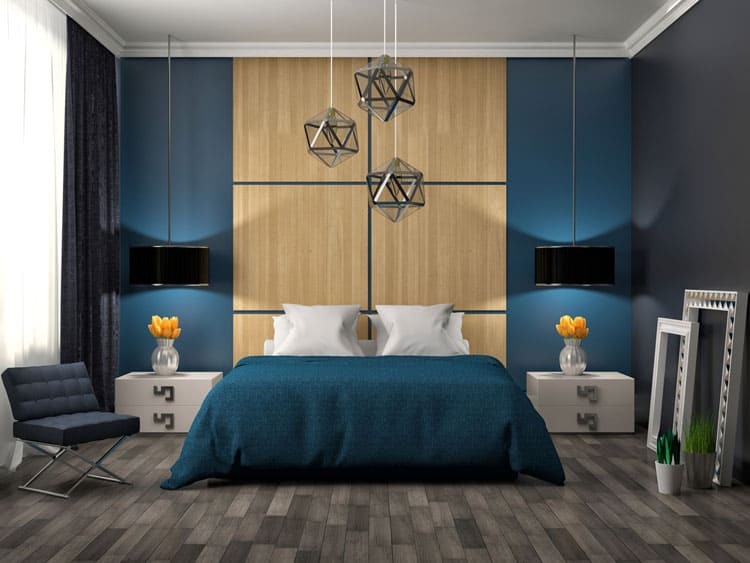 The wood accents complement the blue to create a cozy space perfect for restful slumber. A second floor loft is a great place to carve out a sleeping nook for guests. To keep the space from becoming dreary, keep darker, muted blues in balance with lighter colors. 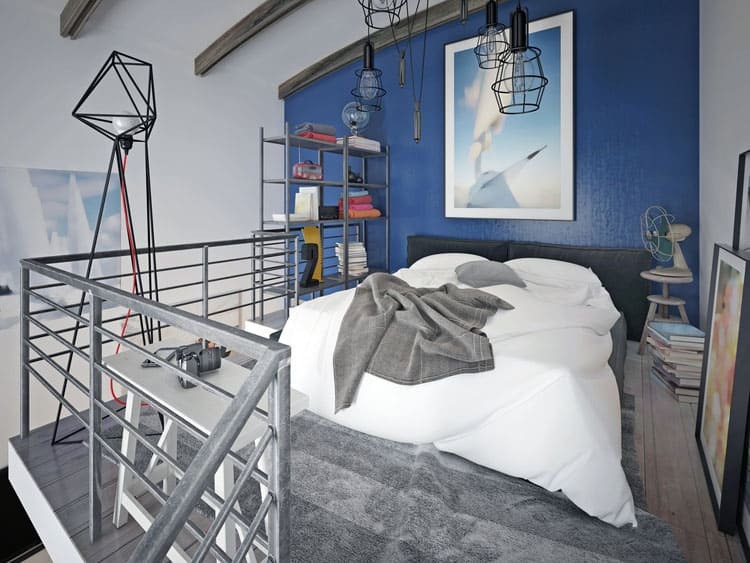 The darker shade of blue on the accent wall adds a trendy air to this loft. The fluffy overstuffed white down comforter and pillows keeps the space feeling light and airy. 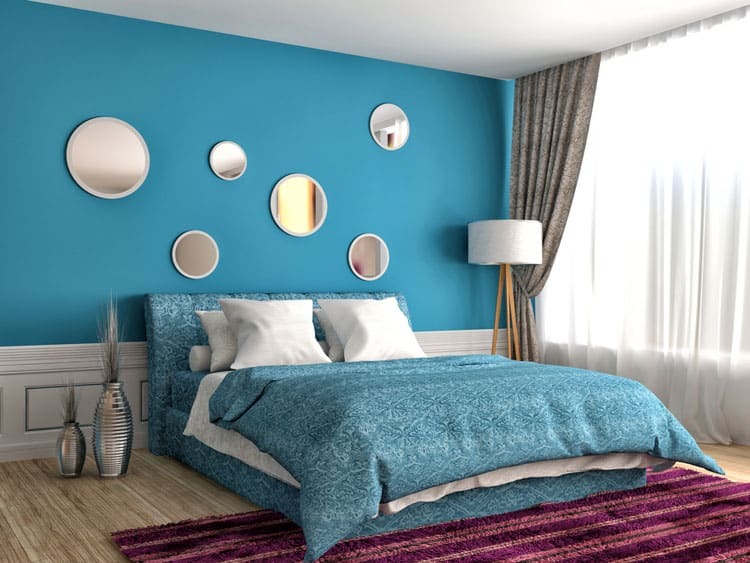 If periwinkle is your favorite blue why not use it throughout your bedroom? This homeowner purchased the comforter and shams in the charming blue and decided to color match the shade for her walls. In the case of extremely bright or very dark shades of blue, limit the color to a single wall. In this example, the color was light enough to use above the wainscoting on all four walls. In most designer circles, blue is one of the only colors you can use on just about everything. This lake house bedroom is the perfect example. The wraparound cabinet and shelving unit was painted in a cheery baby blue. The color was picked up in the bedspread. 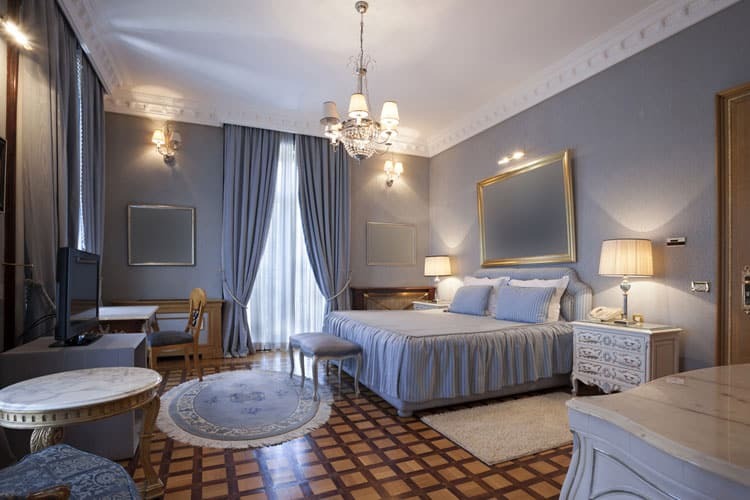 To give the room a breezy feel, the purple in the bedspread was repeated in the carpet. The two analogous colors look great together. Using variations of a single color in the bedroom adds drama as seen in this elegant master bedroom. 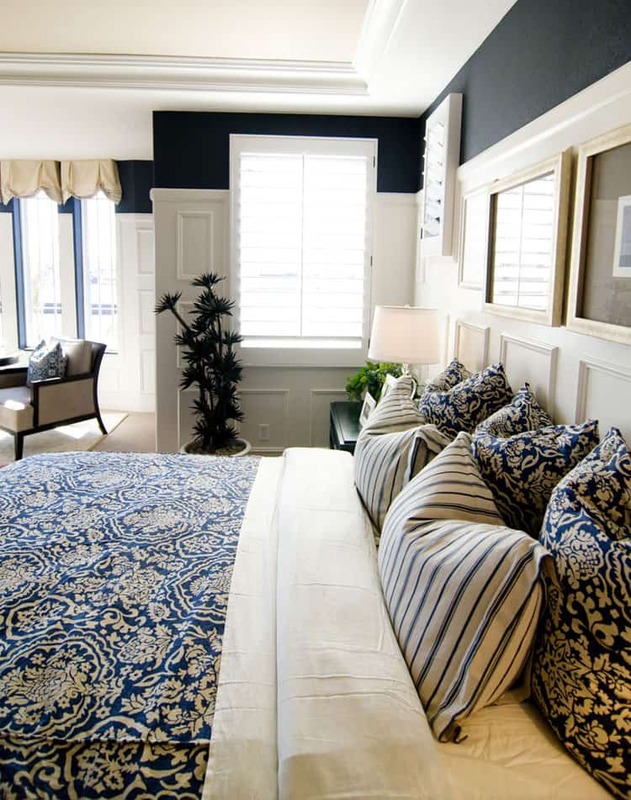 The varying shades of blue in the wall color, rug and bedding help create a calming feel. A mix of bedding patterns adds visual interest and modern elegance to the space. Painting a focal wall in a deep shade of blue gives it a pop of color that is chic, rather than overwhelming. The rug and ottoman reinforce the blue color scheme while the whites balance out the space. Designers sometimes use pale shades of blue to create a space designed for total relaxation. In this Annapolis home, the designer chose Hamilton blue walls to suit the home’s historic nature and give the walnut period furniture a pleasing contrast. Sometimes, it’s impossible to find the just the right bedding and curtains to match your creative vision. This homeowner wanted a specific blue for her comforter, pillows, bedskirt and curtains. She also wanted to mix plaids, florals and solids. She drew out the designs, purchased yardage and hired a workroom to create the fabric components of her picture perfect blue bedroom. In an eclectic bedroom, a brighter shade of blue always injects energy into the space. 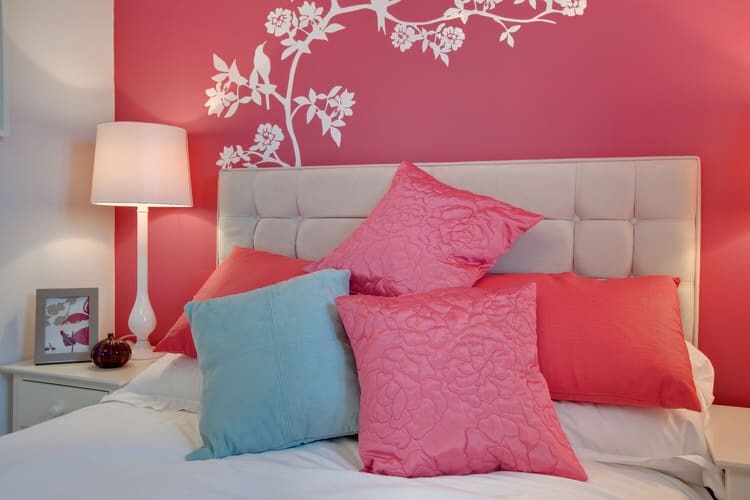 Temper the color by using a striped feature wall treatment, white accents and tiny blue florals for the bedding. The resulting look is crisp, fun and welcoming. 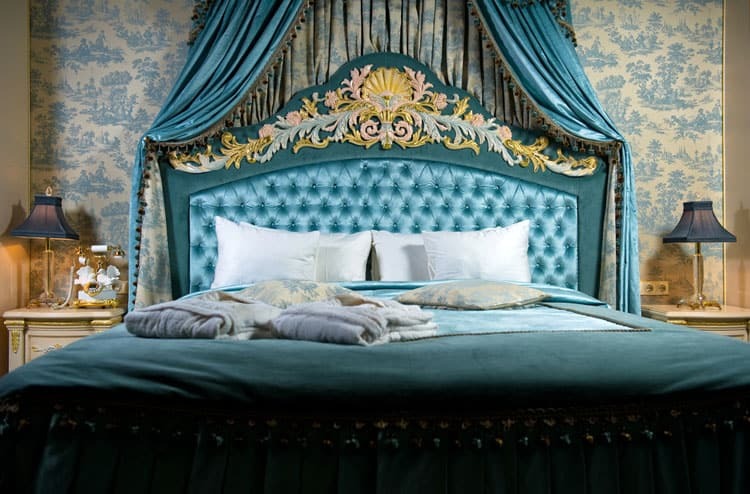 What’s more upscale than a Tiffany blue bedroom? Here, a lighter version of the iconic color is applied to the walls, wrapping the room in sheer luxury. Classic white furniture and neutrals allow the dreamy paint color to be the room’s focal point.